Every summer I pick blackberries from the blackberry bush that owns a corner of my backyard. We’ll eat some immediately and then I’ll freeze the rest with the intention of using them for pies in the winter. Problem is, I don’t like baking pies. My freezer is now filled with several years worth of freezer-burned blackberries. These guys just don’t look edible, so I figured it was time to use them for a dye. I took them out to thaw and noticed a few hours later that half of them were missing. My husband confessed the blackberries were very edible, which is why he used a few cups worth in a smoothie. I’ll admit it, I was slightly annoyed. Until I tasted the smoothie. My hope was that the wool would dye a similar color as my kids berry smoothy mustaches. I wanted to try a solar dye during one of our rare triple digit heatwaves. However, I didn’t have the patience to wait several days to see my results. Instead, I ended up doing three versions: stove top, solar, and semi-solar. This entire experiment was done on a whim, which is why is may sound a bit confusing. I used 3 cups of freezer-burned blackberries, 1 tablespoon of sugar, and enough water to fill a half gallon jar. I put this in the sun for a few hours until the water was hot and the color changed to a rich pink. Note: I used the sugar (a suggestion from various dye books) to help with color fastness. 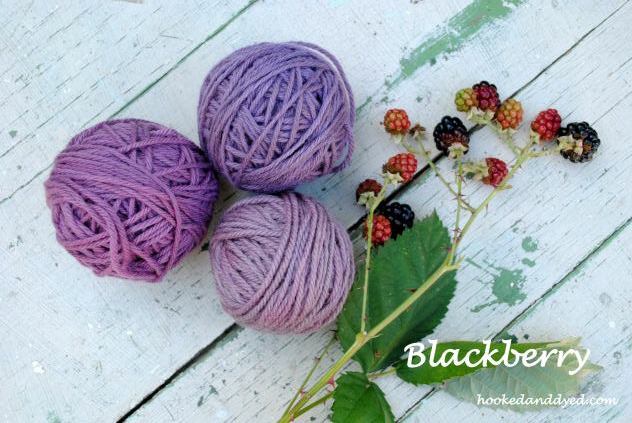 I’ve read that the main concern with using blackberries for a dye is that the yarn will fade. However, all naturally dyed yarn will fade eventually, some faster than others. And the colors they fade into are usually a lovely hue of the original. I dumped the hot dye from the jar and into a pot, crushed the blackberries then strained them out, leaving just the dye bath, no berries. 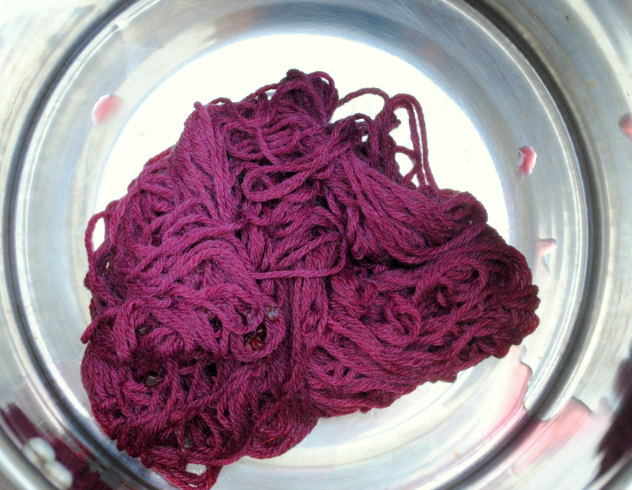 What I noticed about each dye process, was that before I rinsed, the yarn was the same rich pick color as the dye. However, after one rinse, the water ran clear, and the yarn dried with a richer blue tone, to create the lavender color. Stove-top – I poured they dye into a pot on the stove with a 1.5 ounce of alum mordanted wool. It simmered for approximately 20-30 minutes, before I removed it, and rinsed. Solar dye – I poured the very hot dye from the stove back into the jar, added another small skein of wool, and set it back into sun and triple digit temperatures. When I pulled it out 12 hours later, the dye water was still too hot to touch. Semi-solar– I think this was the best mix of both processes, and created my favorite hue of purple. I poured the same dye from the jar back into the pot, added another skein of wool, let it simmer for 30-40 minutes, then poured the entire mixture back into the jar, and back into the sun and over night. Again, the water was hot when I pulled the yarn out the following day. 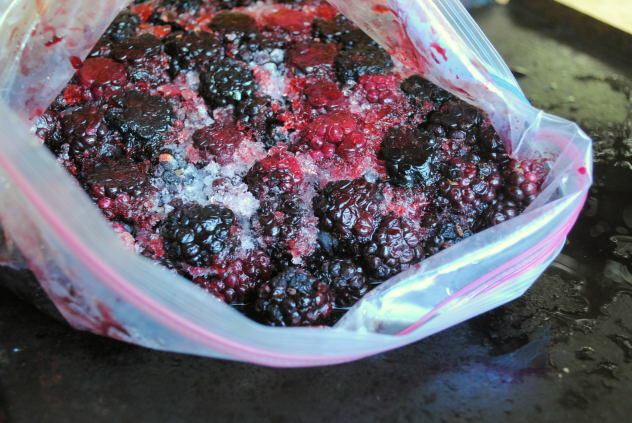 I have another bag of blackberries in the freezer that I’ll use for more semi-solar experiments. What would happen if I added a bit of vinegar or different additive to the dye? That is, unless my husband gets to them first. 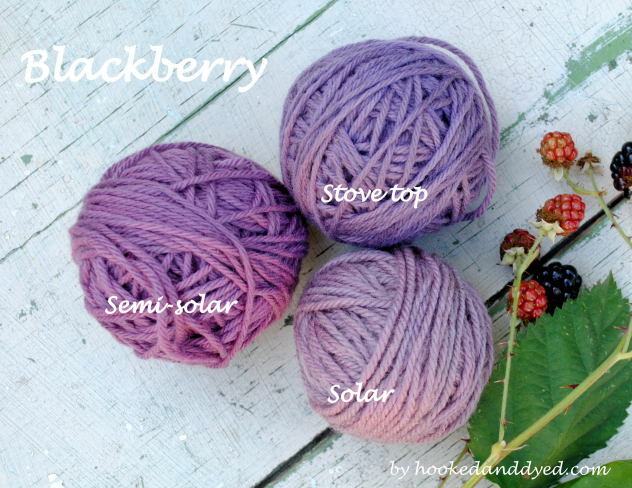 I never thought of using blackberries for a dye (because they taste so good!) but was inspired by Jenny Dean’s book “Wild Color.” She points out that the lavender color can fade over time, but using an alum mordant on an animal fiber helps with color fastness. Adding sugar came from my other main resource “Nature’s Colors” by Ida Grae. Many of the berry dyes and flower dyes are hydrogen sensitive and pH sensitive. They must dry in a shadow or indoors outside the sunshine. 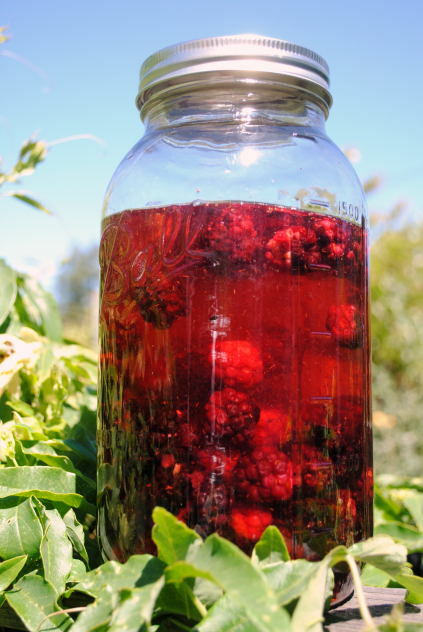 Some say that soaking (1/2 hour or a bit more) yarns (and fabrics) in vinegar before dyeing helps fasten the color. Sugar and salt in dye bath helps also, they slower the reaction and material has more time to absorb dye. Also rinsing in vinegar after dye process helps to stabilicize the result. You know already that acid keeps color more ‘cold’ and soda makes then more ‘warm’. I have tried this in the past – vinegar will change ph and it will affect the color: you will obtain grey.